Light Bead: 2835 6PCS. Remote distance and angle: 6 m bilateral 90°. 6 x LED Puck Light（Battery Not Included ）. Color temperature: 3000k/600k. HASSLE-FREE WARRANTY: One year unlimited warranty. Product Weight: 26g. Battery operated. Fair wear and tear and consumable products are not covered. Fully Linkable. The fitting has two sets of mounting brackets enabling you have a choice of having the lamp pointing down from the underneath of the cabinet or across depending on the affect of light you require. Illuminate under stairs or stair cupboards. Includes wall holder - just lift up and use - like a torch. Easy mounting - includes wall holder - just lift up and use - like a torch. 180 degree rotatable light strip. ✔ Automatic sensor - Motion sensor closet light use advanced PIR sensing technology, it will automatically light up when body enter the sensing area within 120° and 3m. The light will light off after 15 seconds when you get out off the sensing area 3m. 5 super bright SMD LEDs per light. Utilizing high-efficiency LED bulbs that can last up to 100,000 hours, these lights are ultra-light. Each light runs on 3 AAA batteries and the remote runs on 2 AAA batteries. Application: Bathroom, Bed Room, Dining Room, Foyer, Kitchen, Study. - LED beads: 5 ( per light ). Light Source: LED Bulbs. - Luminance: 30LM ( high light ) and 10LM ( low light ). Is Bulbs Included: Yes. The 8 watt fluorescent tubes are also included. Baby & Nursery. Health & Beauty. If they are still unsuccessful they will either. The luminaire is used as a decorative surface for furniture, display windows, etc. to highlight selected places. Remote distance and angle: 6 m bilateral 90°. 3 x LED Puck Light. Its modern design makes it suits any type of interior. 6 x LED Puck Light. Remote distance and angle: 6 m bilateral 90°. Battery life: About 1-2 months. The star-scores are very important to us. Otherwise, we can not receive it. Then we can resolve it soon once we get it. A must have item for cabinets, closets & crawl spaces. Simply peel off the cohesive tape at the back of the light & stick it anywhere you like. Compact in size, light in weight, easy to carry. Can also be used inside vehicles, cars & boats, or be stuck on trunks & bicycles for usage at night. THE KIT COMPRISES OF 2 X 8W INDIVIDUALLY SWITCHED FITTINGS WITH T5 LIGHT WEIGHT ENERGY SAVING FLUORESCENT TUBES. ULTRA SLIM, EASY FIX FLUORESCENT LIGHT SET. FOR USE UNDER KITCHEN, BEDROOM UNITS AND DISPLAY CABINETS. This 2 piece link and light under cabinet light set is ultra slim with an easy fix wire fluorescent fixing set. It is also complete with fixing brackets and diffuser covers. The 8 watt fluorescent tubes are also included. Up to 6 fittings can be linked together. Buy with confident. You May Also like these. Kitchen Adjustable Under Cabinet Cupboard Light Super Bright LED Swiveling. Our design specialists are standing by and ready to dive right into your project and make it a success. Simply install under any cabinet, then use the remote to turn the Ideaworks Under Cabinet Light on and off. A must have item for cabinets, closets & crawl spaces. Ideal for bedside, cupboards, closets, attics, tool boxes, sheds & more. 3 x Led Puck Light 0.3W each 4.5V 60 Angle 36LM. This nightlight is easy to light up ,you just need tap the top of the light, can be used to bright your way in the dark. The luminaire is used as a decorative surface for furniture, display windows, etc. to highlight selected places. Remote distance and angle: 6 m bilateral 90°. 3 x LED Puck Light. Color temperature: 3000k/600k. Remote distance and angle: 6 m bilateral 90°. 6 x LED Puck Light. Battery life: About 1-2 months. Otherwise, we can not receive it. Then we can resolve it soon once we get it. You may also like. New 12W B22 E27 LED RGB Wireless Bluetooth Music Play Speaker Bulb Light Lamp UK. 6 Under Cabinet Cupboard LED Light Kit Kitchen Display RGB Lighting Round Remote. 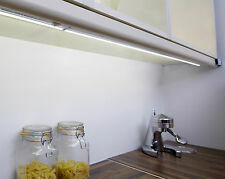 Cool/Warm White UK Hot LED Under Cabinet Lights 3/6pcs Recessed Kitchen Cupboard. 5 super bright SMD LEDs per light. Utilizing high-efficiency LED bulbs that can last up to 100,000 hours, these lights are ultra-light. Each light runs on 3 AA batteries and the remote runs on 2 AAA batteries. Super bright 6 LED light s. From each piece of light emit about 430lm of 4000K natural white light. Luminous color: Warm White. To be used permanently. Luminous color: RGB. Super bright 6 LED lights. From each piece of light emit about 430lm of 4000K natural white light. Power source: 3 AAA batteries (not included).